LE VENEZIANE - This pasta is the best corn pasta around. I used to buy Sam Mills, but I think that this pasta is better. Thankfully, I can find this in my grocery and natural grocery stores around me, but you can find it for cheap online. They have a ton of different pasta shapes in gluten-free varieties that celiacs haven’t had access to before now. Don't go through this radical transition alone. When blogger Gluten-Free Bebe dedicated herself to a gluten-free lifestyle, she struggled to find her own path in how to begin a gluten free diet. Now, she shares all that she has learned in her new book about being gluten-free. 3 Steps to Gluten-Free Living is also now available on Amazon™. This informative guidebook breaks gluten-free living into three practical steps: eliminating gluten, transitioning your heart and home, and substituting tasty, gluten-free foods and ingredients in your recipes and your pantry. I have been looking for gluten free shells since I was diagnosed with Celiac Disease and thanks to Quattrobimbi, I am now able to satisfy my craving! Quattrobimbi imports all kinds of pasta from Italy. If there is a type of pasta you have been looking for, they have it. Quattrobimbi carries several different brands of premium corn-based pasta, as well as Italian cookies and crackers. Senza Glutine in NYC serves Le Veneziane pasta ! The company behind our favorite gluten-free pasta, Le Veneziane, has expanded into the heat-and-serve market with three microwaveable Express dishes: penne with pomodoro sauce & basil, macaroni & cheese and macaroni & mushrooms. Also new from the company is shelf-stable potato gnocchi. All of the products are made in Italy and are GMO free. Let me just say, I love these cookies ! Available in two flavors: Frutti di Bosco (mixed berries) and Cacao e Nocciole (chocolate and hazelnut – yum !) both are fantastic! Most similar to a shortbread cookie, these are buttery and crunchy and perfect for dipping — in milk, coffee, you name it. The chocolate and hazelnut is the perfect combination of light cocoa notes with a nutty taste – like Nutella in a cookie without being overly rich. The wild berry was the real surprise – a tasty vanilla cookie dotted with dried fruit that just pops with flavor – like a whole raspberry in each cookie ! Available online from QuattroBimbi, these cookies are utterly delicious. Leave it to the Italians to develop the best gluten-free pasta! Le Veneziane takes the #3 spot with their corn pasta. This pasta tastes much like wheat pasta and cooks to ‘al dente’, perfectly. Unlike other gluten-free pastas, it does not produce starchy, milky colored water when cooking. We have used this brand with all our pasta dishes with superb results. Le Veneziane is imported from Italy and is available at some stores, but easy to obtain online. Le Veneziane is available in fettuccine (it comes in boxes of 6 fabulous ‘nests’), penne and several other pasta styles. One of the first things we miss when going gluten-free is pasta. Automatically, it seems that even if we didn’t love pasta before, we want what we can’t have now. There are many gluten-free pastas out there with slightly different tastes and textures, and it seems everyone has a different favorite. Typically gluten-free pastas are made of white or brown rice flour, however, it is becoming more common to see gluten-free pasta made with diverse ingredients, such as corn, quinoa, buckwheat, even pasta made with bean flour. Usually, I go with Tinkyada pasta as it holds up really well, and works nicely in basked dishes and pasta salads. Generally no one can really tell the difference. It is my standard go-to pasta, and the one most readily available in most grocery stores. However, a couple of months ago, while shopping at the Gluten-Free Trading Company in Milwaukee, I asked what they felt was the most popular and best tasting pasta. They recommended Le Veneziane, which is imported from Italy and 100% corn pasta. I figured the Italians know how to make pasta, so I would give it a try. This pasta is also vegan, soy- and dairy-free. I was a bit skeptical it would taste very corn-like, but I was proven wrong. I made the fettucini tonight with a light wine cream sauce with sauteed broccoli, and if I didn’t make the pasta myself, I would of had to double-check the pasta box to be sure it was indeed gluten-free. The texture, the taste, it was just like regular fettucini from my pre-gluten days. My gluten-eating husband could not even tell the difference. I could have just eaten it plain with olive oil and some fresh parmesan cheese, it was that good. I will definitely go back this brand, and try the other styles. I have definitely found my new favorite gluten-free pasta! It is also available in bulk from other online retailers, including Quattrobimbi and Amazon. Is dairy or gluten making you sick ? TODAY nutrition editor Joy Bauer explains food intolerance, offers advice. A-maize-ing Pasta - It had been a while since our family last tried gluten-free pasta made from solely from corn. Years ago, we tried DeBoles corn spaghetti-style pasta but were not impressed. So it was with some skepticism that we used Molino di Ferro's Le Veneziane gluten-free penne, made from 100 percent corn flour, as part of a family pasta dinner that also included a lasagne made with BiAglut egg noodles. It was the first time we had used pasta from either brand. At the moment, there are no stores in the Delaware Valley stocking products from these companies. The products can be ordered direct from Quattrobimbi's website. Perfect Pasta Salad - Pasta salads are a great dish for potlucks, barbecues, picnics, outdoor parties and just about any summertime meal. Years ago, I used to love pasta salad, but once gluten became an issue and I had to substitute gluten-free pasta in my pasta salads I found myself sadly disappointed in the taste and texture of my once-loved salads. Let’s face it, soft, mushy pasta just doesn’t work well in a cold pasta salad. So I found myself just avoiding pasta salads and focusing more on fresh green salads or other side dishes like potato salad. However, now things have changed. Our world of gluten-free foods is rapidly changing with the entrance of quality, authentic tasting foods and that includes pasta! Years ago, I attended a conference in Chicago and heard about a little Italian restaurant, called Da Luciano, that served gluten-free pasta. My mother and I sought out the restaurant and found ourselves enjoying delicious pasta dishes that were amazingly authentic in taste. The pasta tasted like the real thing – we were shocked. We asked the woman who owned the restaurant which pasta they used and discovered, our now favorite, imported Italian gluten-free pasta – Le Veneziane made by Molino di Ferro. This corn based pasta holds up and cooks (as it should) to al dente and works perfectly for hot dishes and cold pasta dishes. The company produces a wide variety of pasta including shells, penne, fettucine, spaghetti, and more. The great news is that this now has brought back pasta salads to our family. I encourage you to try this pasta (especially if you have found yourself discouraged with the pastas that are readily available in the markets). You can purchase Le Veneziane pasta on-line at Quattrobimbi. Bi-Aglut Pasta - Our favorite Bi-Aglut pasta is back for sale in the US. We love this pasta for its taste first - it just tastes like wheat pasta. And for its texture second, it is not starchy at all, holds up great in pasta dishes like macaroni and cheese. It may seem pricey, but we can get two meals out of a bag of bi-aglut spaghetti while a bag of de boles spaghetti was not enough to give my family one meal. You can order it from GlutenFree.com. Another fun source is Quattrobimbi which imports gluten free products from Italy. Italians have been gluten free much longer than us, and they seem to have an upper hand on the gluten free products. If you order from Quattrobimbi get the ZeroGrano crackers. They are so much like wheat crackers you will not believe it. Perfect with Tomato Soup. My Pasta of Choice - I will only endorse a product if I passionately love it. Le Veneziane pasta is one of those products. Since Italian is my focus area of my culinary training, I am very picky about pasta. This corn pasta is exceptional: beautiful yellow color; easy to obtain the al dente texture; not gooey upon cooking; and the flavor is sublime with a delicate corn flavor that compliments whatever flavors are bought in the pasta dish. I just received my case of Le Veneziane past today and I'm so excited; I ordered it from Quattrobimbi. “Le Veneziane” Gluten-Free Pasta - Gluten-free pasta is a tricky thing. If you’ve tried the various brands and types on the market, you know: "gluey, dense, soggy, tastes off-putting" are just a few of the adjectives to describe when a good idea for a gluten-free pasta goes bad. When I went gluten-free, back in 2005, I looked to the blogosphere to see which brands people loved and hands down it seemed to be Tinkyada, which I’ve stuck with as my go-to brand ever since. And the pasta? Enzo was right! Made al dente, the texture was right, the mouth feel is great and with some meat sauce on top it tasted like “real” pasta to me. Now mind you I haven’t had wheat in 3. 5 years and one’s tastes changes when one eliminates a food. But for my money, the pasta that Opus served me last night was delizioso—I have half of it for lunch today and I can’t wait. “Le Veneziane” is not so easy to find as Gluten-free NYC discovered last year. However, you can get it on Amazon.com and through Quattrobimbi who will be doing a pasta giveaway this month through my newsletter ! It took me a while to figure out, but all the gluten-free products are sold in the pharmacy! Schar has quite a number of excellent products in Europe (ciabatta breads, chocolate croissants, focaccia, baguettes, etc) that they apparently don't sell/ship here because they are perishable. There is also another great brand that I encountered in Europe called "Galbusera," which had amazing crackers and cookies. There were six little bird’s nests of pasta which means you have to cook each nest in full or break the pasta up to cook it. We guessed that three ‘nests’ was the right amount for us for dinner and that ended up being dead on. I cooked the pasta and then handed it over to my husband to make his special dish for the first time in a very long time. The pasta took on the alfredo sauce very well. We have found that sauces don’t always stick well to gluten-free pastas. The better the pasta quality, the better merging of pasta and sauce. Even so, there was a slight yellow color to the pasta, leaving me still skeptical about how it would taste. There was no need for worry because the fettuccine alfredo made with La Veneziane pasta was the best we’ve had in almost four years! The pasta did not taste anything like the corn pasta we’d had before – or corn for that matter. Is the difference the corn? I always thought corn was corn but this pasta is made with corn that is grown not far from Venice. The soil is said to be exceptional there. Still, it’s shocking that the corn they use to make this pasta makes a product that tastes ten times better than all the other corn pastas we’ve had. I guess it doesn’t really matter why the pastas are so different. The pasta from Italy is truly exceptional and I’d proudly serve it to glutenoids any day. I’ll stick with the healthy Andean Dream for Macaroni but for my husband’s house specialty – and any other pasta dishes that call for fettuccine, it’s Le Veneziane for us from now on ! 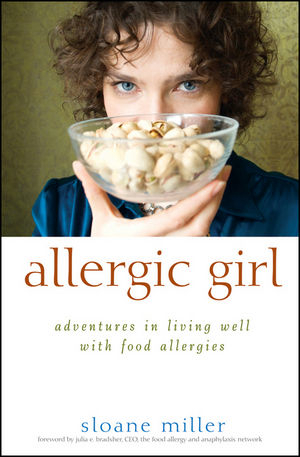 An indispensable guide for living a full life with food allergies from an Allergic Girl who lives it. Enjoy your food-allergic life to the fullest. Let Allergic Girl show you how. Pre-order ALLERGIC GIRL now !